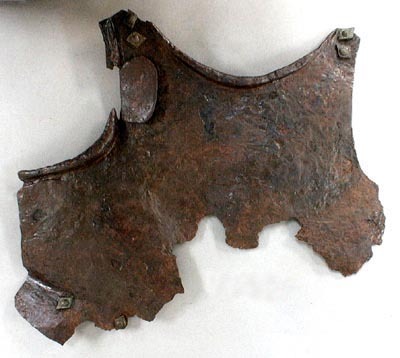 Breastplate Section: This large section of an early 17th-century breastplate has been flattened while buried in a trash pit, thus it appears distorted. The rolled edges and brass rivets at the shoulders and on the skirt are typical of the pikeman suit breastplates recovered from Virginia sites. This example has a small flap in the armhole, a feature not found on other breastplate sections recovered from the 17-century settlement site Jordan’s Journey (Hopewell area) or other sites nearby.